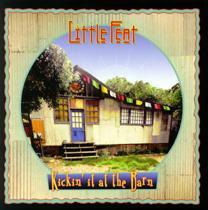 George Graham Reviews Little Feat's "Kickin' t at the Barn"
A lot of us Baby Boomers may have trouble recognizing the fact that it has been more that 30 years or more since the bands who came to identify the Woodstock era had their heyday. Not surprisingly, most of those bands are no more, having either broken up, of suffered the death of a key member. Of those who remain, probably the majority are now playing their oldies on the nostalgia circuit, and these days, perhaps on PBS-TV specials. There have also been notable reunions that turned out to be quite lucrative. But there are a few performers and bands who remain creatively active, continuing to make new music and not spending their much of their time wallowing in the past, no matter how much their aging fans may request the oldies. One such 35-year veteran group, who remain creative after all these years, is Fairport Convention. Another is Little Feat. The veteran American band, who three years ago marked their 30th anniversary, is out with their newest release Kickin' It at the Barn. Little Feat was formed in 1970 by the late Lowell George, who wrote many of the group's early classics, along with current member Bill Payne, as well as Roy Estrada, who had just left Frank Zappa's band at the time. It was not long before the current rhythm section of bassist Kenny Gradney, drummer Richie Hayward and percussionist Sam Clayton joined. After Lowell George died in 1979, the group continued on for a while, then went into hiatus for a few years, as the various members worked extensively as studio musicians. Keyboard man Bill Payne was on scores of albums during the 1970s and Eighties. The band reformed in the late 1980s, with the addition of guitarist Fred Tackett and ex-Pure-Prairie League vocalist Craig Fuller, who left after a couple years. Meanwhile, Ms. Shaun Murphy, who had been adding some backing vocals and percussion since 1988 became a full member of Little Feat. Little Feat has always been a band happy to go off in several different musical directions, thanks to the diverse background of the members. Lowell George was a singer-songwriter with some Southern rock influence. Kayboard man Bill Payne had always brought a jazzy element a'la Steely Dan. The rhythm section is known for their great funk groove, often with a New Orleans-style undercurrent. They have created a very rhythmic approach with a slightly odd way of accenting beats that is instantly recognizable as Little Feat. Guitarist Tackett is also a versatile and busy studio musician, and he also can bring a singer-songwriter facet to the music. So the band can jam, get funky, create something akin to jazz-rock fusion, rock out, and also have something to say lyrically. Their new CD, their first studio album since 2000, continues the group's diverse but instantly recognizable sound. The CD's title, Kickin' It at the Barn comes from its recording venue, a barn-like building on Fred Tackett's property in Topanga, California. They moved there after Paul Barrere had to do some remodeling in the garage that previously served the band. Barrere writes of roughing it with water leaking in, and apparently neighbors complaining about the noise. But with the studio smarts of the band members, and a dash of computer audio recording technology, Kickin' It at the Barn is fully up to Little Feat's traditional high standards. Once again, there are opportunities to hear different voices in the band, both musically and literally, with Barrere's unmistakable vocals, along with those of Payne. Also contributing both compositions and vocals are Tackett and Ms. Murphy, as was the case on their last studio release Chinese Work Songs. According to Barrere, they went back to the way they used to create songs, on acoustic guitar and piano, then letting the rest of the band flesh them out, including writing the lyrics, which with this band, tend to come after the music. That method of working also ends up being reflected in the final product, with a fair amount of acoustic instrumentation being heard. With more serious lyrics is Heaven Forsaken, also by Barrere and Tackett. Despite the words, the tune has an old-fashioned Rolling-Stones-style feel. Altogether it works quite well. The CD ends with a song that remained pretty much as Barrere and Payne wrote it on the acoustic guitar and piano. Bill's River Blues provides a nice coda to this generally upbeat recording. Kickin' It at the Barn the new, 18th album by the venerable band Little Feat shows that despite the 33 years that have passed since the formation of the group, they are still is fine form, coming up with new original music and seemingly determined to avoid being lumped in with the has-beens on the oldies circuit, even though they were dropped by their record company long ago. This independent release shows that they have not lost their ability to come up with music that is both rhythmically infectious and interesting in a number of ways. The band's musicianship is first-rate, and the increasing use of acoustic instruments on this CD is a welcome development, but tey don't forsake the party element to their sound. Our grade for recording quality is close to an "A." Most of the band members are veterans of many recording sessions as studio musicians on big-budget projects, and their attention to detail is evident on this CD, which one could never tell was recorded in a rickety barn with equipment scrounged together. But, our album review would not be complete without our almost weekly complaint about dynamic range lost by pushing the recording to being louder than it needs to be in the mastering process. Although Little Feat tries some different twists on their new CD, the important elements of their sound remain, Paul Barrere's distinctive vocals, the driving, often danceable beat, occasionally punctuated by some tricky rhythmic figures and the all-around great musicianship. Long-time Little Feat fans will not be disappointed in Kickin' It at the Barn, and who knows, maybe with the interest in jam bands among younger music fans, the CD could help a newer generation discover this great American band.